This easy to make homemade Pho will satisfy any and all cravings you might have without being overly greasy. Skip the delivery and make it yourself! I think one of the best things about making this soup was the day of jokes. The jokes rock. "You made this? Pho reals?" Every Monday Adam goes out to lunch at a Vietnamese restaurant and has pho. I've never gone out for pho, and he has never brought me back any. After about the sixteenth week, I stopped secretly hoping he'd bring me some and started whining about it out loud. Although I used homemade beef stock for this recipe, it's okay to use a can or a carton. Put all of the broth into the crockpot. Add the meat, green onion, ginger, fish sauce, and spices. Cover and cook on high for 3-4 hours, or on low for 4-6. It's done when the meat is fully cooked. I used a 6qt Smart Pot for this recipe and it took a good 4 hours on high for the large amount of broth in my crock to get hot enough to cook the meat. 15 minutes before serving, add the entire package of rice noodles to the pot. Push them under the liquid with a wooden spoon, and cover. By the time you set the table, the noodles will be tender and glass-like. Serve in bowls. We didn't add any additional garnish, but you can add bean sprouts, fresh cilantro or basil, and lime wedges. This has a very nice mellow flavor. I loved the hint of anise (tastes like black licorice) and the cinnamon. I needed to add more salt because I used the homemade stock as the base. Adam said it tasted the same as the restaurant's, but not as oily or as salty. The next day the flavors were even more pronounced (but the noodles got weird. Next time I'm not going to add all the noodles at once) and made a lovely lunch. The night I prepared this, we had company and the children were playing too hard to stop and give it a taste test. But the little one ate quite a bit the next day for lunch. Oooooo, yummers! I love pho. In a separate pot on the stove, cook the noodles, but in the bottom of the serving bowls, ladle soup over noodles. This is how its done in the restaurants. Then you also don't get the funky noodle texture the next day. You just boil a new serving of noodles. Woohoo! I'm so glad that it turned out well. I'm particularly tickled by the pronouncement that it was restaurant quality pho. 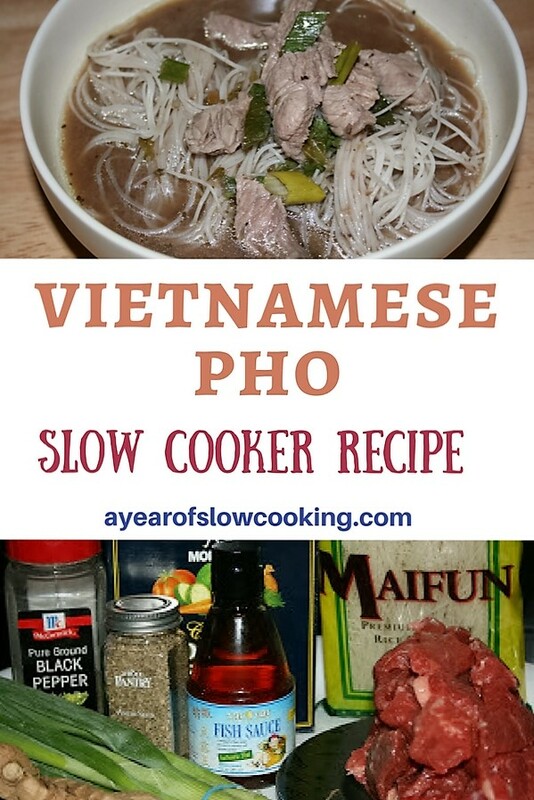 I've always wanted a good pho recipe, so finding a crockpot version is a total bonus. I'm definitely going to try this. Thanks! BTW: I'm pretty sure that "pho" rhymes with "duh." We're surrounded by pho restaurants here and there are some that make you smile just because of their names (Pho King, What the Pho?, etc.) We just don't mention them when the kiddos are in the car. Yeah, sounds like phuh~, I think. You wouldn't need more salt if you added fish sauce. That's the salty component but like you, I hate the smell. It tastes good though. If you add more fish sauce, you can use a squeeze of lime to freshen it up. Cilantro, Thai Basil, thinly sliced onion, thin slices of jalepeno, and mung bean sprouts (without heads!) are a really great accompaniment. I'm going to try this again with all of your awesome suggestions---thank you! YUP - pho is pronounced 'fa'. Also, in addition to cooking noodles separately (to prevent absorbing all the broth), if making beef pho, the beef is sliced paper thin and added to the soup bowl raw, on top of the noodles. Then paper thin slices of onion are heaped on next. Then comes the boiling hot broth that separates the noodles, and cooks the beef & onions. Serve with raw bean sprouts, sprigs of Thai basil (very different taste from Italian basil), jalapeno slices, lime wedges, hoisin sauce, chili sauce. I LOVE pho! I love pho and for the last year I consider myself something of a Portland Pho expert! I can't wait to make this! I'm doing it this weekend. I wonder how it would work with seafood instead of beef? I'll have to try both recipes! Thanks so much. Your recipes are always fun and inspiring. Yummy, this is in my crockpot right now. I can't wait to try it. My husband loves this kind of soup and I am hoping he likes it. Thanks for this recipe. I am going out for Pho tonight with a friend who is gluten-free. I bought all the stuff to make this for the poor kids and hubbie who don't get to go. I will have to use ground ginger though. made this one... it was good! I think I may have put in too much anise, but it was stll yummy. 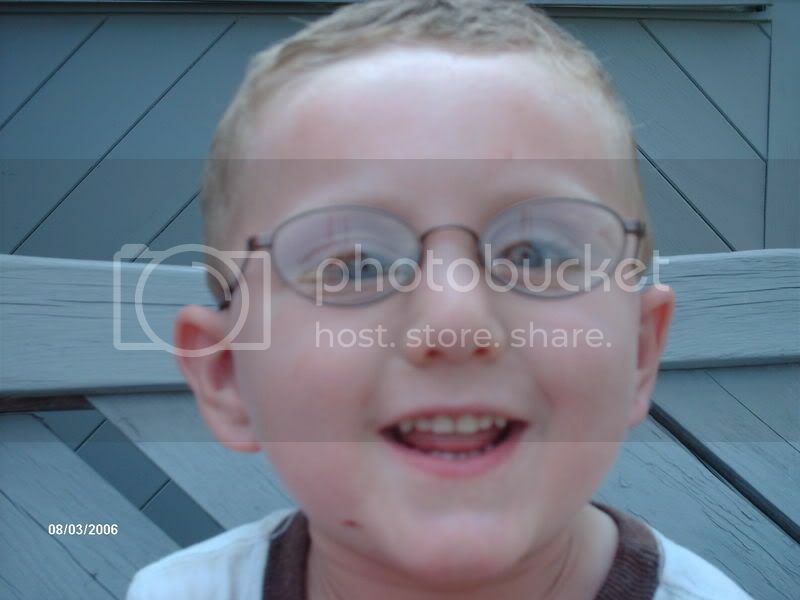 how fun that I found this one! My husband and I just went out for Pho last week! I'm totally going to make this! Thanks for the recipe, and for the blog!! Just returned from Vietnam, and it is definitely pronounced "FUH." And oh, so good. The way to do it is cook your chicken to shreads one day. Next day, make your broth. Boil the noodles separately. When serving, put noodles, a handful of raw greens like green onions, asian basil and others on top, then a handful of cooked chicken. Pour broth over top. mmmmmmmmm. $2 for a hearty bowl on any street in Vietnam. So far I've only had this in the crock an hour, but it is already smelling perfect. Thanks! Gah! I'm so upset. I was planning on making this for dinner, and I put everything in the crockpot. I forgot to plug it in!!! So, six hours later I just threw away 6 dollars worth of meat, and homemade veggie stock. I finally got to have this. I used stew meat, but my own beef broth made from cow bones. It was a bit on the greasy side, but I did remove as much fat from the broth as I could. The bf said it tasted like real food. I served it with a bit of romaine lettuce, two kinds of cherry tomatoes, and a basic vinaigrette. I copied and saved this recipe; I'm calling it Pho Slo! BTW: I never did like how green onions end up after slow cooking; so I'm including them in the garnish. The white parts are OK, but the greens get slimy. I made this for my husband who is Vietnamese. He LOVED it (even tho he kept telling me I was making it wrong! LOL) and it was the first time I'd even had Pho. My son loved it too! I just finished my first bowl of this. YUM! I added mushrooms for a little something extra. I have never had Pho before, but I've heard such good things about it that I had to give it a try. Can I just say PHObulous!!!! I found that what made the flavors pop was by adding the recommended garnishes - the lime juice and cilantro just brought out so many more flavors, and the bean sprouts gave it a nice crunch. This will definitely be a regular meal in our home! Thank you for such a fun Friday night recipe! Pho is my favorite meal ever!! I'm so glad you posted this (I just recently found your blog) and I can't wait to give it a try! Thanks so much! This looks so much easier than most recipes I've seen.. It's almost a faux pho. (I know--the pronunciation is wrong--a faux pas). Looks so good! You know if you want to make it more authentic you would make the broth bit first and then put the thinly slighted beef at the bottom of the bowl you are going to eat it from topped with the noodles and then add the broth steaming hot. This will cook the beef if you have sliced it thin enough. You should really add the basil, coriander, lime wedges, bean sprout, chili sauce and a teaspoon of hoisin too. Makes it even nicer. I have been to Vietnam and ate pho for three weeks straight awhile back. All restaurants there add noodles just before serving. In fact, lots of times they would be crunchy in my soup and I would have to wait for then to soften up before I could eat the soup. Love it! 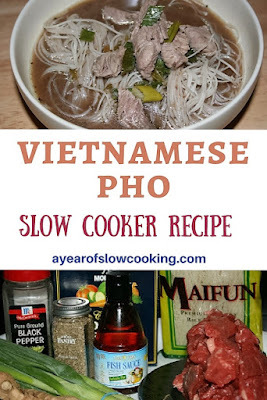 I make my pho in a slow cooker all the time and I love to check out other people's recipes on how I can improve mine. The noodles you are using isn't pho noodles. The pho noodles is wider. Look for the words "banh pho" or "pad thai noodles" on the package. The noodles you have there is called "bun". You can soak the noodles in room temp. water for the duration it takes for you to make the broth. When you are ready to serve just dunk the noodles into the hot broth and add it to your bowl. Or you can pour boiling water over the noodles and let it sit in the boiling water for 5 to 10 mins. making yesterday's broth for pho tomorrow - pho shizzle! (stole that from a store front for pho) this is going to be delicious - don't leave out the fish sauce - it is key! now why can't I pin this to my pinterest page? What is "anise"? Is there something more common I can replace it with? Hey this looks awesome! They were out of anise and green onion so I sautéed two big fennel bulbs in butter in it. I also added some bok choi and snow peas and shiitakes.